Cobbler only gets better when you pair peaches with cinnamon rolls. I love cobbler. It's such a great dessert with a load of wiggle room. You can pair so many different fruits and the cobbler toppings are aplenty. You can have a biscuit-like topping, dumpling-like topping, or in this case, a cinnamon roll topping! It's a super simple dessert to make and honestly, it totally works well for breakfast too. I'm not judging at all. It's time for some more favorites from the archives! We love milkshakes in the summer and these CUPCAKE MILKSHAKES are easy and wonderful. I can't think of anything better than having two childhood classics in one in these SLOPPY JOE GRILLED CHEESE sandwiches. 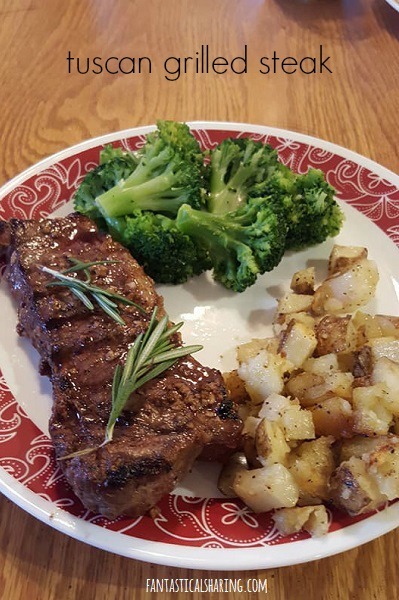 The most flavorful marinade makes for a wonderfully juicy and delicious steak! A childhood treat in (no bake) pie form that is so incredibly easy to make! As a child, I had root beer floats all the time. My grandma kept Mug root beer and vanilla ice cream (by the gallon) on hand, so when I visited I could have a root beer float. As an adult, I really don't drink soda very often. I might have the occasional root beer or Sprite when I have fast food, but that's max once a month. I would give up soda completely except that I love root beer entirely too much. I saw this recipe and immediately saved it and put it on my meal plan. I like to let my ice cream melt just slightly to stir into the root beer to get that light frothy mixture and this root beer float pie really captures that stage of a root beer float. It's heavenly. This pie doesn't take many ingredients and it's no bake. It's perfect to make the night before any get together. It's so easy! June has been very successful in retaking pictures for recipes and I'm really looking forward to finishing that so we can go back to trying new recipes once again. I do have a few new recipes to make this week: the lasagna boats and marble cake. I am also hoping to actually making my two breakfast recipes this week. My oldest asked me why I hadn't been making breakfast recipes anymore - oops! This fantastic meal is everything you need all in a foil packet - cook it on the grill or in the oven. I'm all about the foil packets right now. I have made one particular foil packet dinner for years and years and years (Hobo Dinner) and branched out recently with different proteins and vegetables in these recipes. This particular foil packet recipe is marinated chicken with zucchini, carrots, onion, and potatoes. I love that there was an option for grilling or baking in the oven. I opted for oven baking personally because I love how easy it is to just open the packets and get nice browned and bubbly cheese on top with the help of my broiler. The marinade is fabulous with lemon, balsamic vinegar, and a variety of spices. It's a great summertime meal for sure. This month's Fantastical Food Fight theme is SEAFOOD. I was nervous about this one because your girl only eats canned tuna and that's about it. On occasion, I will eat a couple popcorn shrimp, but otherwise, I just don't eat much seafood. June is National Seafood Month (US food holiday) and I've tried to pick a variety of ingredients or dishes to have for the Food Fight, even if it isn't something I particularly like. I stepped outside of my comfort zone here. Years ago, Nick ordered blackened ahi tuna steak at a local restaurant and it was truly one of the best things either of us have ever eaten. I knew when I chose seafood that I would attempt to do tuna steak at home. I didn't want to do blackened tuna because I wanted to go super simple for my first try, in case I messed it up. I found this recipe for herbed tuna steaks on Food Network and was incredibly nervous. Tuna steak isn't cheap and I didn't want to make it inedible. I researched and researched to make sure I did it correctly. My tuna steak was a little over an inch and a half thick so I cooked it slightly longer but I should have stuck with the original cook time. I didn't ruin it by any means, but it wasn't medium rare. I was really excited to able to use some herbs from my Aerogarden too. All-in-all, it was way less scary than I made it out to be and I would definitely buy it and make it again. I made pork chops using the same recipe as the tuna and they were just as delicious. Add a little crunch to your burger with delicious fried pickles! Fried pickles have been an obsession of ours for the last few years after having discovered how delicious Zaxby's fried pickles were. Though we also discovered they were "seasonal" and Zaxby's hasn't had them for a while. The reps on Zaxby's Facebook page told me they have no plans to bring them back at this time. WHICH IS GARBAGE. But it's also forced me to try and come up with a copycat (which hasn't been very successful since I cannot compare it directly with Zaxby's because they haven't sold them since 2016). Apparently, I didn't really look at what was going on because I made the most epic slow cooker meal week without realizing it. Guess this will motivate me to clean that sucker out every evening after the meal is put up! I love no-bake desserts that mimic cheesecake and I love any time I can get a cherry recipe because I don't have cherries enough. I think on the rare occasion I do, it's atop a sundae or milkshake. I don't think I have ever made anything from fresh cherries, so that's definitely on my foodie bucket list. But for now, I have to share this wonderful dessert that is no-bake and uses canned cherries. You can absolutely bake the crust for more sturdiness, but I actually like it better unbaked. This really reminds me of the Jell-O cherry cheesecake but a littler heartier. Today's throwbacks are both sweet. First up is a sweet breakfast recipe. These CINNAMON ROLL WAFFLES are kind of like those cinnamon roll pancakes that have been viral for years. Except less mess because you making the swirl separate and serve it as a topping. I personally am super biased and love a good homemade waffle, so I think these waffles are supreme! The second recipe is a dessert that although is more of a wintertime dessert is one my husband would happily eat any day of the year. This PECAN PIE CHEESECAKE is the best of two desserts put together. The brown sugar cheesecake is brilliant on its own, but the pecan pie filling really is a lovely partner and adds a wonderful crunch to this dessert. I highly suggest making it! Coffeecake in muffin form - these buttery little "cakes" are perfect with a cup of coffee in the morning! Or afternoon! I currently have a super picky 3 year old who is surviving solely on cheese and freeze-dried fruits. Occasionally, he will eat a cheese quesadilla or chicken or ham. If I'm really lucky, he'll eat pancakes or muffins. Mason LOVES these muffins and he ate most of the batch by himself this go-around. This recipe is not necessarily complicated, but you do move around some mixtures a little bit, so it's best to read the directions a couple times through before you start making it. The batter is also very thick, but don't worry, it's supposed to be that way. These muffins are buttery and full of lots of cinnamon sugar goodness with pecans all throughout them. The perfect way to celebrate summer - by grilling fresh veggies with sausage! 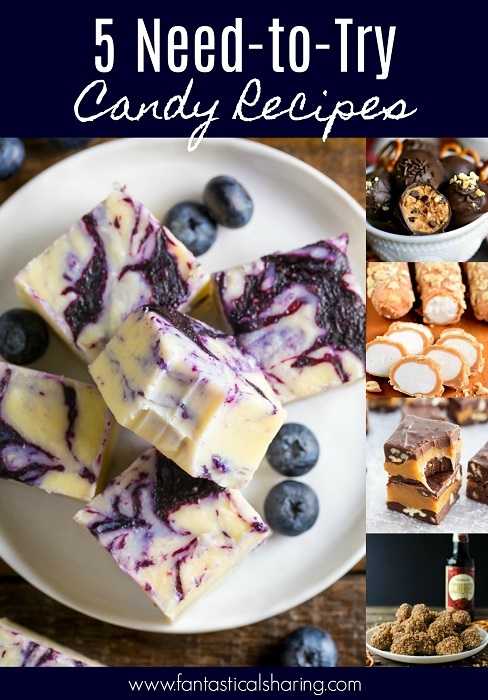 June is National Candy Month and I shared some of the recipes I am most excited to try. I'm keeping it short and sweet today with these five amazing recipes. The perfect side dish for a good Southern meal, chili, or potluck! My mother-in-law made this amazing corn casserole recipe last year and I have been craving it ever since. Lo and behold, I had a similar recipe saved from one of my magazines. She has all these tried-and-true cookbooks that she has made from since my husband was very young and I believe the recipe she used was a Taste of Home recipe. Mine is from All Recipes. It's simple to throw together and it is seriously so so delicious. I love that the cornbread comes out incredibly moist and then you get so much corn in every bite. It's the best side dish for chili or fried cabbage and sausage plus so much more! I love making bundt cakes and I wanted to attempt to make more in the past year or so. This one (although it didn't turn out super pretty) was very tasty. I loved the strawberry lemon combo and the Greek yogurt made it incredibly moist. I think this would be great subbing in blueberries, blackberries, or raspberries, but I really enjoyed having strawberries in a dessert. It seems like most of the time I don't get to bake with fresh strawberries. So this cake was a welcome rarity! All but Monday's foods are remakes due to losing pictures from my computer crash. I am looking forward to them all because I loved all of them! I'm not 100% sure I'll make everything though because we will have family in town. Low and slow makes for the most wonderful tomatoes on this BLT sandwich! I absolutely love BLTs. I mean what's NOT to love?! But then you add an element like roasting tomatoes plus throwing in a basil mayonnaise and you have peaked my interest for sure! I opted to grab a multigrain bread like the recipe called for and it was the perfect heartiness to go with the rest of the ingredients. I don't remember exactly how long I cooked my tomatoes, but I believe it was just under 4 hours. What a seriously great twist on a regular BLT.